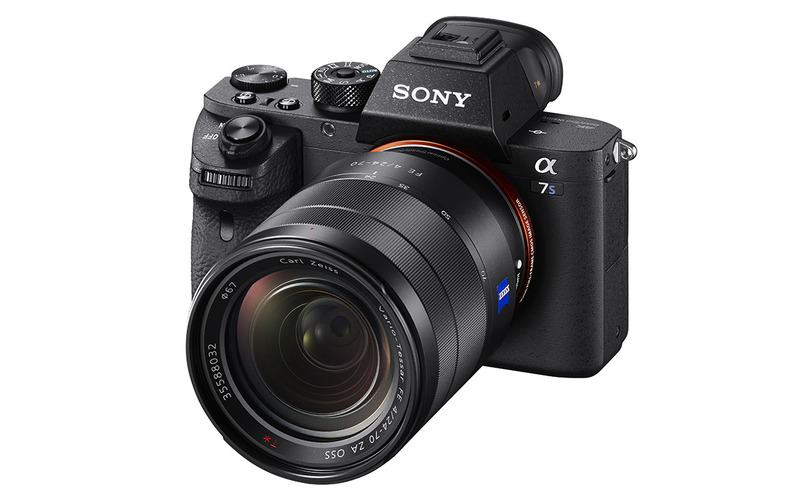 Sony has revealed the mirrorless full-frame Alpha A7s II, the successor to one of its most unusual cameras. The original Alpha A7s carried a maximum 409,600 max ISO setting, allowing images to be captured in near darkness. The new model has similar powers, but fixes the biggest problem with the old one. You no longer need an external recorder for Ultra HD video, as the A7s II now has internal 4K recording (3,840 x 2,160) at 24 or 30fps. It also uses a full-frame sensor readout with no pixel binning at both 4K and 1080p resolutions. In layman's terms, that means you'll get sharper 4K video with no moire or jagged edges. The A7s II retains the same 12-megapixel sensor and 409,600 ISO light sensitivity of the original model. But, it can now shoot 1080p video at 120fps with a full-frame readout, which Sony says is a first in its Alpha A7 series. It also introduced a new shooting mode called S-Log3, which allows for 14-stops of dynamic range, on par with cinema cameras like the Arri Amira. Video is recorded in Sony's XAVC format at up to 100Mbps, meaning you'll need at least a UHC Class 3 SD memory card. Unfortunately, it' limited to 8-bits, unlike Sony's professional, 10-bit-capable models. Another new feature is 5-axis stabilization, which it borrowed from the recent Alpha 7 II. That means you'll get less jitter on shots taken at night or with long, telephoto lenses. It has a new autofocus system with 169 AF points for quicker and more accurate focusing, and the high ISO sensor's lack of noise means you can often focus on objects not visible to the naked eye. Finally, there's a new OLED electronic viewfinder with 0.78x magnification that should make for easier manual focusing at night. This is not a camera for everyone, of course. For one, it costs a considerable €3,400 for the body only, nearly €1,000 more than the original Alpha 7s (we're still waiting for US pricing). The low 12-megapixel resolution, which yields pixels big enough for those high ISO images, will also discourage many still photographers -- who may prefer the 42.4-megapixel, $3,200 Alpha A7r II. However, if you're a videographer who'd love built-in, full-frame, 4K video with no pixel binning and ultra-high light sensitivity, it'll come to Europe sometime in November.